We have compiled a list of the most frequently asked questions by our customers here. We hope you find this information useful. However, please don't hesitate to Contact Us directly at any time. We can ship the marker to anywhere in the continental US. Most customers prefer to have the marker shipped directly to the cemetery to save the hassle of moving it themselves. Your marker will arrive within 3 weeks of placing the order. This allows for our 2 weeks of production time and up to 5 business days shipping, depending on location. How do I have the marker installed? You will need to contact the Cemetery regarding installation. 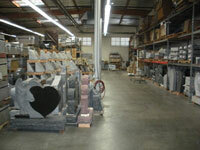 Let them know you are ordering a granite marker from an outside vendor. They will need to know the type and size of the marker. With this information they should be able to give you an accurate price and approval. Can I have two names on the marker? Yes, the 36" marker is for companions. Simply click on this size and it will allow for the companion information. If you would like companion information on a smaller size please call us and we will accommodate your request. How is the lettering applied? All of the text and artwork is sandblasted to a depth of approximately 1/8”. The grey marker inscriptions are then painted black and the red and black marker inscriptions are painted white. Yes, we can order any size. If you do not see the size you need please give us a call and we will give you a quote. How much does the marker weigh? The weights vary depending on what you choose. For example, With packaging, our 3" thick 12" x 24" marker will weigh roughly 100 lbs. The 4" thick 12" x 24" markers, with packaging, will weigh roughly 120 lbs. They can go as high as 1000 plus Lbs. The preview you see before entering your credit card information is used as your proof. If any adjustments are made to your design, a new proof photo will be emailed to you for approval. If you don't have a credit card to use, you can print out your design from our website and mail it in with a check or money order. Please be sure to include your contact information when placing an order through the mail. If the marker is lost or damaged during shipping, we will replace it at no charge.